Jumpers J30 and J31 must be set to the CPU position(left) to enable the UART0 over the USB bridge capability. 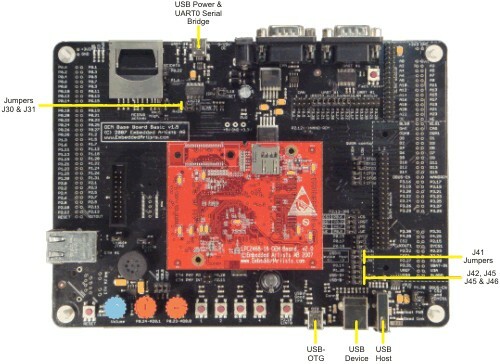 The J41 jumpers that connect the USB overcurrent, USB power and USB LED signals must be installed to use the MCB2400's USB channel B as either the USB device or USB host. Jumpers J42, J44, J45 and 46 are installed as a group to the left for USB device mode enabling the USB B connector, or to the right for USB host mode enabling the USB A connector. The mini-USB connector for USB-OTG has no jumper settings.